Two red fire engines, a fireman pole and um, acrylic paint and falafel wraps? When I heard that an old fire house in Qatar had been converted into a contemporary art gallery, I was curious. When I found out they had also opened a cafe, I was sold. Fortunately, Doha Fire Station lived up to my expectations. Situated slightly inland from the city's seaside promenade, the Doha Fire Station commands attention with cheerful yellow garage doors and a bright red fire truck parked outside. After a new civil defence property was built, Qatar Museums transformed the old station into a gallery and studio space for local artists in their residency programme. 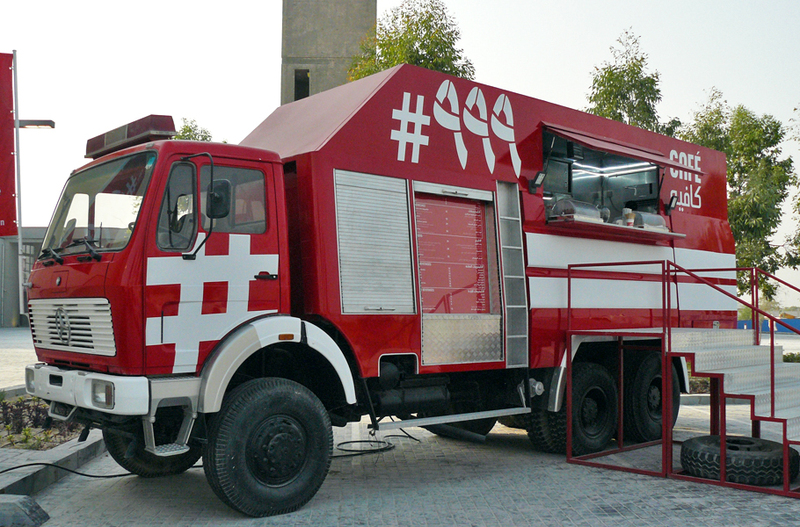 In mid-2016, they opened Cafe #999 (a play on Qatar's emergency number, 999) and the accompanying food truck, which is a renovated fire engine. I know, right? The Garage Gallery at the station now houses various exhibitions, including the works of the Fire Station's artists in residence. We visited during one of these exhibitions, which featured everything from giant resin-based works reminiscent of the solar system to 3D-printed pieces alluding to the modernisation of Mecca. Thanks to a book supplied when you enter the space, you can read up on all the artists as you move around the gallery, learning about their influences and creation process. The residency program is currently open to nationals and residents of Qatar, so the exhibition was a exploration of different cultures and stories, told through vastly different mediums but brought together in one space. Augmented reality installations, which invite visitors to pick up a tablet and learn more, stand alongside giant canvas works and patterns created with dyed sand from the Qatari desert. 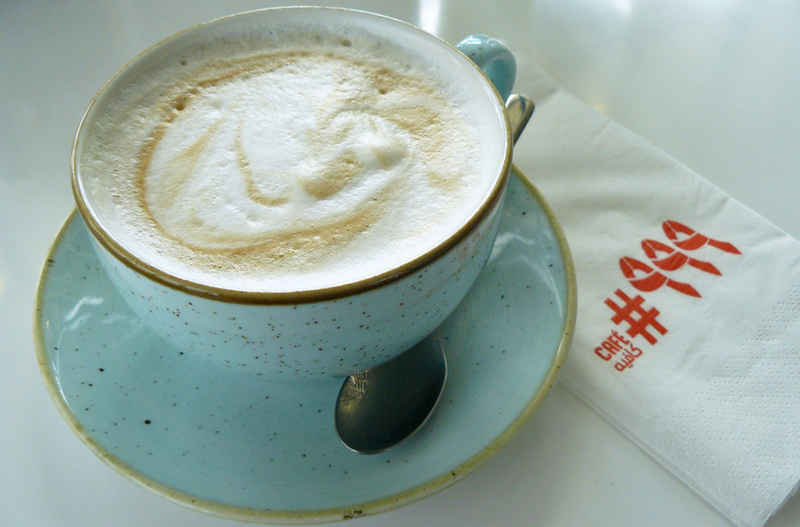 With a floor-to-ceiling windows, exposed concrete walls and Scandinavian-inspired furniture, Café #999 is a gorgeous place to sip a cappuccino and gaze at the towers of West Bay in the distance. The minimalist space is open and relaxed, with floating shelves displaying colourful art and cooking books available for purchase. The carefully branded and styled eatery offers modern dishes with Arabic and Asian influences. The menu is filled with contemporary takes on regional favourites like tagine, falafel, haloumi, camel burgers, lentil soup and mint-infused lemonade, along with interesting options such as "nutrition shots" and sweet treats. I was surprised (and borderline ecstatic) to see so many vegetarian options -- from pasta to starters to sandwiches, the meat-free choices made up a considerable portion of the menu. Cafe #999 offers a haloumi veggie burger, pomegranate and garlic falafel wraps, a number of vegetarian pastas, a lentil soup and gourmet salads. It's a space I can imagine spending many a relaxed weekend morning, sipping cappuccinos from a mint blue cup while reading a book or getting some work done on my laptop. The food truck, which is Doha's second oldest fire engine, is parked outside and offers a take-away version of the dishes. There are plans to eventually take it out on the road too. I may just have to add the Doha Fire Station to my list of must-sees for first time visitors to the city. If you're a fan of design and food, this trendy and intriguing mix of art and cuisine in a stunning industrial-chic refurbished space is a great spot to see.